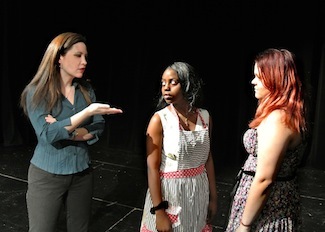 My short play Reconstructing Julie debuted brilliantly under the expert direction of New York director Natasha Yannacañedo. Her consultative style and creative vision helped the play earn industry praise and further productions. I’ll always associate the success of this play with Natasha. She gave it life! A simple, hokey internet questionnaire becomes transmogrified into poignancy when Cynthia (remarkable Jenn Remke) informs us that her friend, Laura, (lovely Laura Kamin) at the computer, across the country in New York, was going for a job at the World Trade Center on September 11. Director Natasha Yannacañedo keeps it simple, effective. Festivals can be more than just theater fun. They’re realms for discovery. Discover. Natasha is an amazing and insightful director. She is completely sensitive to the actor’s journey and strives to pull out the best work from her actors while making sure they feel supported, creative and encouraged. She puts her cast immediately at ease and at the same time energized to create. She is detail oriented and strives for the absolute best no matter what the constraints! Natasha's astute insight and acumen as a director stem from her background as an actor, first and foremost. She is able to utilize actor parlance while still maintaining her position as director and providing space for discovery-- truly, an "actor's director." Natasha's a real actor's director. She'll be real with you all the time and take nothing less than perfection. She can teach you how to make the part your own. Natasha Yannacañedo is a talented actress and director. She has directed several shows that I've been in and I have always been amazed by her dedication and hard-work. Natasha directed me in a one act, and it was a thoroughly enjoyable experience. Given that Natasha is an amazing artist herself, she helped me develop my acting skills and better understand the text which had to be delved into beyond its face value. Professor Yannacañedo is a talented actress and director with much experience on both stage and screen. She has mounted a number of plays with her students here at St. Francis. She served as the director of our college wide student group, The Troupers, with a number of professional and demanding plays completed including Months on End, and Angels in America. This was a significant contribution to the academic community at our college. © Copyright NY Acting Company / Natasha Yannacanedo. All Rights Reserved.